Manchester United’s interim manager Ole Gunnar Solskjaer has taken a brutal dig at the tactics of his predecessor Jose Mourinho. 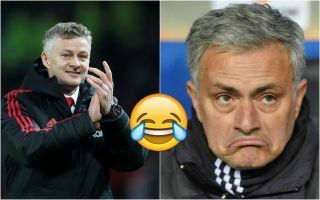 The Portuguese was sacked by the Red Devils earlier this season after a nightmare first half of the campaign, and Solskjaer has since been placed in charge of the team until May. There is growing talk, however, that after an incredible start, the Norwegian tactician could now be in line to land the job permanently ahead of big names like Mauricio Pochettino and Zinedine Zidane. Solskjaer would be a popular choice with United fans, that’s for sure, especially after little comments like this that mock the dull tactics of Mourinho before him. “That’s what Manchester United are built around – attacking football and going forward. Not stupid square and back passes,” the 45-year-old is quoted in the Mirror. MUFC supporters will be thrilled to have their team back playing the kind of football that their traditions demand. Solskjaer is now the bookies’ favourite to be named next permanent Man Utd manager, moving narrowly ahead of Spurs manager Pochettino.